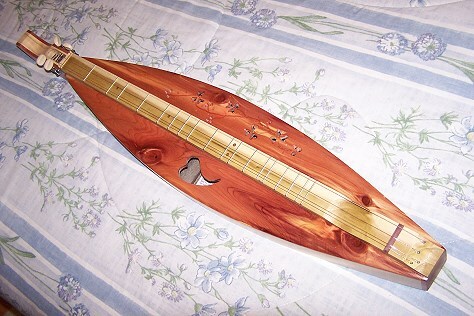 This is a 4 string Mountain, or Lap Dulcimer. I learned to build these in the Smokey Mountains. They take many different shapes but all play the same. The one shown is my standard model. It has a 6 1/2 fret for sharps and flats. The body is made from Red Cedar on top ,Cherry on the sides and ply on the back for strength. The instrument is my best seller. I have sold several hundred of this model. They are great fun to play. Any body can play one. They are played by numbers with one finger. 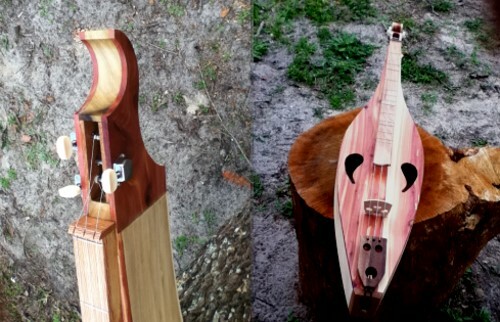 This is a new production from Smokey Mountain Dulcimer Works, the bowed dulcimer. 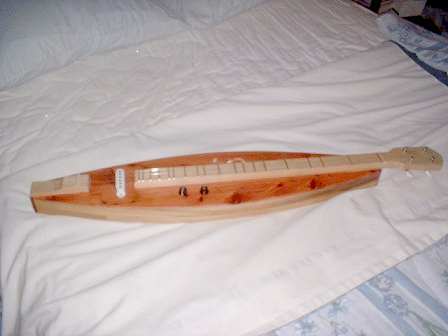 This has the usual dulcimer shape but is played in a similar manner to a cello. It is held upright and the base of the instrument is rested on the players lap. You can get some beautiful haunting tones from this great instrument. Each one of these instruments is hand-built and crafted by myself.